My father made a couple of trips back to Italy and Gagliato in the late 80′s and by then I was married with 2 children. Each time he wanted me to come with him and it hurt so much for me not to be able to go with him. But it was exciting to sit with him when he came back home to look at all the pictures he took and hear the stories of his experiences. On his last trip, he had become ill while there and he had to return early, only to be gone from us a year later. 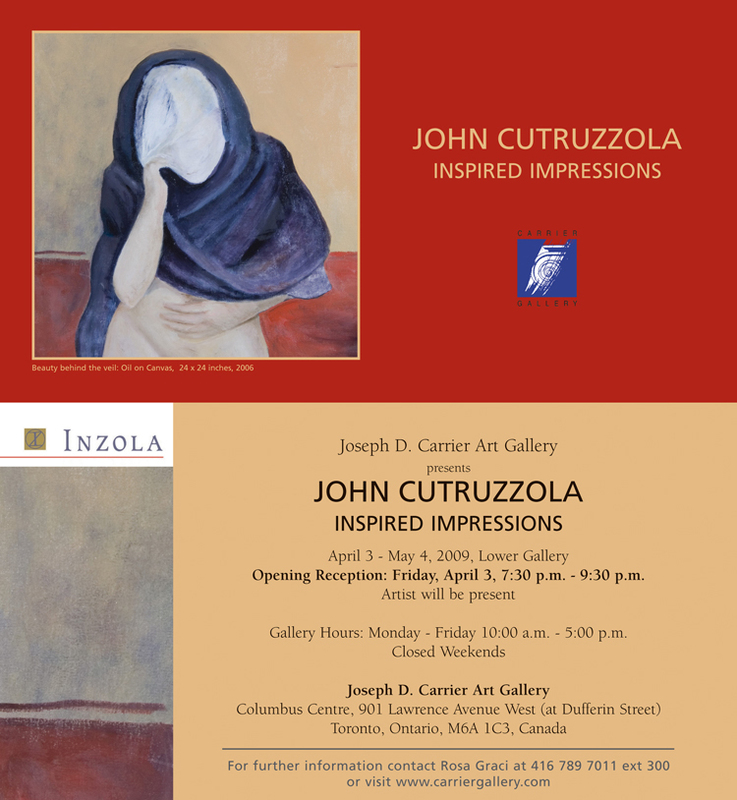 His experiences that he shared with me and this “unfinished” visit fed my desire to visit Italy, especially Gagliato. My first trip to Italy, I dedicated to my father. It was my desire to “finish” the trip for him and, more importantly, for he and I to spiritually share this trip together. I wanted to be alone with him, wanting no one to intrude on this “spiritual journey”. My quest was to see Gagliato through his eyes; walk the streets he walked as a boy growing up there and as a man returning many years later; to see where it all began – where I began and to find, with simply an old, faded photograph, the very first house Nannu built in Gagliato. Arriving in Soverato, a city I often heard my family, especially my father, talk about, I was filled with emotion. I descended from my train and stepped onto the platform where so many, many years ago, my father, as a small boy, carried luggage to earn money. Not even yet in Gagliato, I was walking in his footsteps! Up above Soverato, on this clear September day, I could make out the faint mountain-side towns, knowing that one of them was Gagliato. So I boarded the little blue bus in Soverato to embark on my journey up an old, winding hillside road; the road my father, as a young boy, traversed daily to the Soverato train station. Suddenly, as the road levelled, a small sign on the right-hand side of the road, beneath a bending tree, announced my arrival in Gagliato, and for a moment I was struck with awe and disbelief that I was really here; that Gagliato did indeed exist. Stepping from the bus, an amazing hush met me and the absence of people except for a few men. The view up Via Regina Margherita was vacant, sunny, strange; and yet, I knew it. Walking up that “famed” street, I saw the palazzo Nannu later built for the family; the palazzo where my family still resided. Looking across the valley on my left, I saw the little, years-old vacant house that was the very first house Nannu built; the little house I heard so much about growing up. What a tremendous feeling it was for me to put my hand on the wall of that little house; to walk on the very ground where it all began; to feel my father smiling down on me. It is the stories and traditions and language that was an integral part of my upbringing that makes me value my ethnicity. To keep our culture and traditions alive, it is important to share our stories with our children and grandchildren. It should provide them with a sense of their selves set the spark to further research their roots and, perhaps, visiting the very place where the stories originated. I do not speak Gagliatese nor understand it too much anymore. I speak Italian fluently enough to function quite easily in Italy and for the year I lived there. However, the Gagliatese dialect is part of our history, is special and should be kept alive. And so, in closing, my upbringing such as it was, leaves only a slight language barrier that separates me from Gagliato, nothing more. What is this place, Gagliato, that is ingrained into oneself from earliest understanding? Where is this place, Gagliato, that possesses one’s thoughts throughout a lifetime? What makes a small child sit at the edge of the seashore to just stare out eastward over the sea wondering about a land she hears about so much; what it looks like, feels like? This child is Gagliatese; who she is; born into regardless of not being born there; yet possessing the blood, heart, soul of Gagliato. When the child is grown, people wonder about the strong attachment and heartfelt affinity with the people of the “old country”. To some, this strong attachment and affinity could be looked upon as somewhat of an oddity for a person born and raised in America. The explanation is simple. The child is Gagliatese; birthplace of the father, grandparents, great-grandparents; where still to this day remain members of the immediate family who still reside and live. This child, being the first of the family to be born in the new world, became part of and totally immersed into this Gagliatese nucleus that was to last 12 years; living in a neighborhood inhabited predominantly of Italian immigrants, (including a large extended family) most of which were from Gagliato, speaking language(s) that were a mixture of Gagliatese, various other dialects of Italian, broken English. The stories of Gagliato abounded; just about everything had a relationship to Gagliato. This “little Italy”, rich in its roots and traditions provided the “backdrop” for this child, seeing everything done the Italian way and hearing the Gagliatese dialect. It is within this neighborhood and with these people where the child felt safe and secure; developing a true sense of identity of ethnicity, and how these influences formed the child’s philosophy throughout its life. At the age of 12, the child is shattered to learn that circumstances deemed it necessary to move out of the beloved neighborhood. The Gagliatese dialect and Italian, no longer being heard on a daily basis, was forgotten as the child is now immersed into a world of mixed cultures, proving to be a little intimidating to one who did not fully understand the exposure to a more completely American/Americanized environment. A child who never fully understood what some of her peers were talking about regarding their lives and activities and not being allowed to participate in because it went against beliefs. Hopefully it is easier for one to grasp that being raised with the principles and traditions of the Gagliatese, it is that environment within which the child felt more comfortable and upholds to this day and setting a goal to visit Italy and Gagliato and even to live there. The stories told by the family, the traditions by which we lived form the ethnic character of the child that carries them throughout life. In the past, I have written that many people who were born in Gagliato and have emigrated away likely do not discuss “Gagliato” openly, but they do hold it, the town and/or the concept, very dear to their heart — in silence. It’s almost like suffering in silence. I believe those individuals have a lot to contribute to our understanding of Gagliato and Gagliatesi, and I would be fascinated by their contributions. For culture to remain strong, it must be passed on. I urge you to consider sharing your experiences with the members of this forum — and the world. 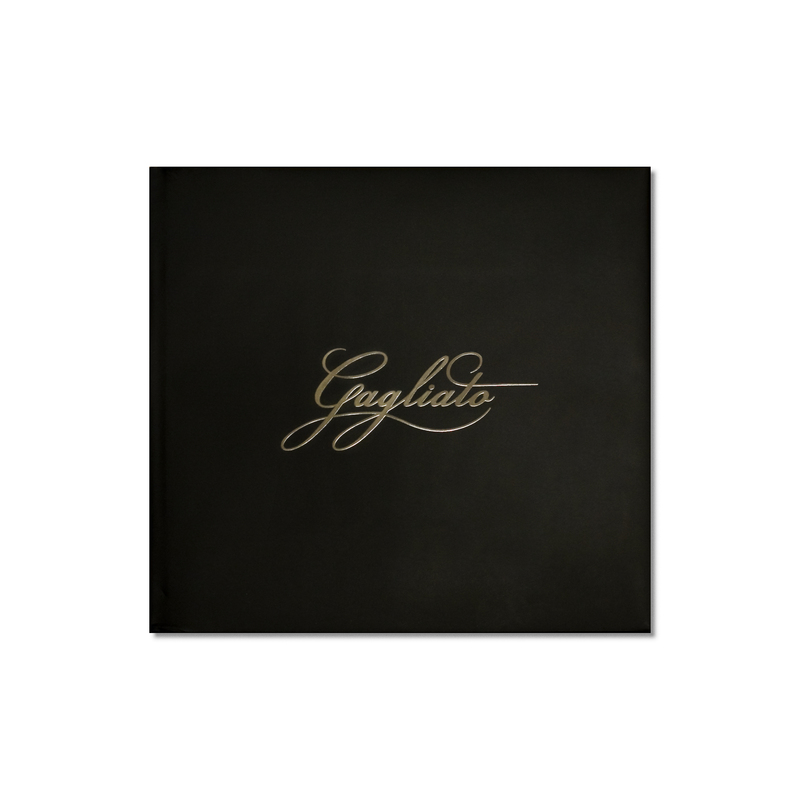 On January 10, 2009 Gagliato was presented with “Gagliato”, the photography book recently released by Nicola & Stephanie Gareri. The ceremony included an introduction by Gagliato’s Mayor, Giovanni Sgro’, the reading of the authors’ letter by lawyer Francesco Gareri from Argusto (the authors’ representative), and closing remarks by lawyer and former Mayor, Luigi Romiti. Many were in attendance as books were distributed to individuals who hosted or assisted the photographers while in Gagliato as well as to individuals who were photographed and presented in the book. Photographs of the presentation are available online at the La Strumba blog as well as at the Ergon Cultural Society site (see the “links” section). The various written sections of the book will be translated into Italian and presented in summary form on the La Strumba blog over the coming weeks. Selections of Nico (Nicola) and Stephanie Gareri’s successful photo exhibit (in September 2008 at the Carrier Gallery) on display in the front foyer at the Columbus Centre from December 9th until January 28, 2009. 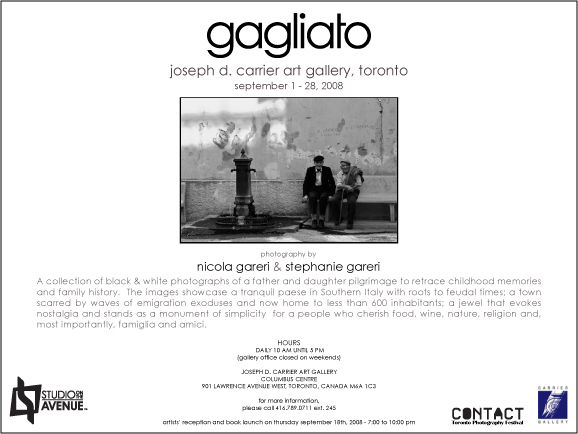 Nico (Nicola) and Stephanie Gareri’s first photographic (coffee table) book, simply titled “Gagliato”, was launched on September 18th, 2008 at the Joseph D. Carrier Art Gallery in Toronto. The 300+ guests in attendance were treated to a special presentation of the “Gagliato” photographic exhibit which included 46 framed limited edition prints, musical interludes by Jon Gareri (piano) and Sahra Featherstone (harp), and a delicious variety of cheeses, breads, grapes, berries, figs and wines. The exhibit was well received by the many visitors during its scheduled run (September 1st – 28th) and its extended stay until October 2nd. The book “Gagliato” is available on-line and at selected locations. Please visit http://www.studio-on-the-avenue.com for details.